Are you planning on motorbiking Vietnam? Will your trip be two weeks or two months? Can’t decide if you will go from Ho Chi Minh to Hanoi? Perhaps you just want to explore the far north or south. Fear not, whatever direction, and however long you plan to go for, this ultimate Vietnam motorbike route is for you. I’ve made several motorbikes trips around Vietnam where I’ve visited large cities and small ethnic villages. Drank the strongest rice whiskey and the best mountain coffee. 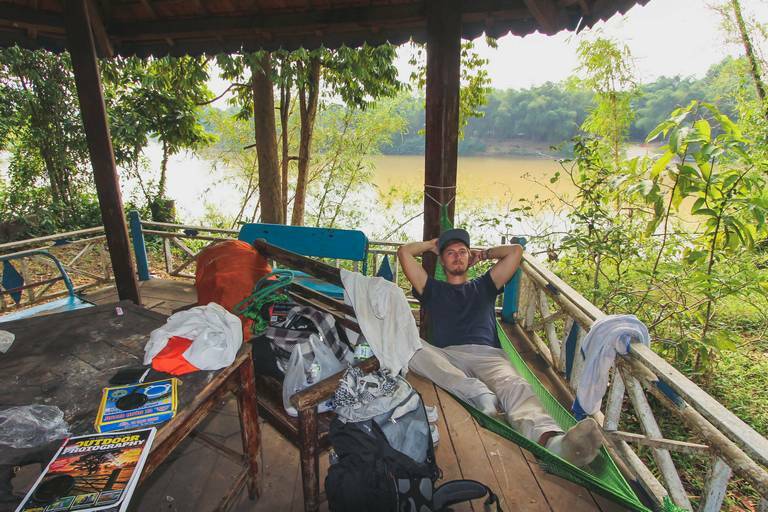 Slept in boutique resorts and in hammocks in the jungle. Now I’ve combined that information here. 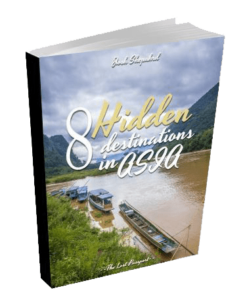 Throughout this article, there are links to more detailed guides I have written on individual destinations. I highly suggest having a read of them too. There is definitely no shortage of amazing scenery in this country. 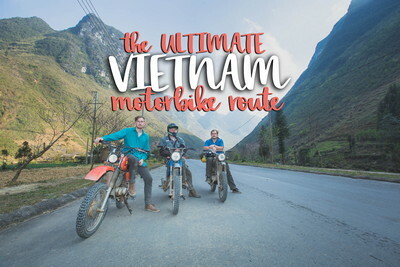 In this ultimate Vietnam motorbike route, you will get to ride along amazing beaches and scenic mountain passes, explore the world largest caves and get way more off the beaten track than you’d ever imagine. 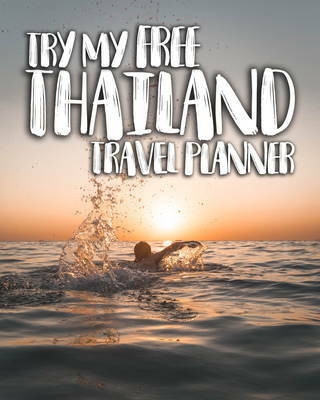 This guide covers over 23 destinations (and growing). However, I have not included all the exact route numbers. For those, I highly recommend getting this detailed road map of Vietnam by National Geographic. You’ll thank me when you’re lost without an internet connection. Glad we got that out of the way… Ready? Let’s go! Sit down, get a cold beer and a bowl of Pho soup. You’ve arrived in Vietnam with a huge (2300km+) journey ahead. Ho Chi Minh City is the starting or ending point for most travelers in Vietnam. One way or another you’ll end up here. Why start in Ho Chi Minh City? It is the easiest place to buy a motorbike in Vietnam and get it fitted with a luggage rack for your long ride. If you are arriving in Vietnam solo and want to find people to join you for the big ride ahead then be sure to stay a couple of nights at the main backpacker street Pham Ngu Lao (seriously awesome hotel deals for under 15 USD per night). You’ll know you’ve arrived at the right place when you see loads of small street stalls selling beer at 25c per can. There is a great motorbike shop at the end of Pham Ngu Lao street. Though I don’t know the name of the road, just look for the big red neon bull sign. The shop is there on the corner. First stop, Can Tho. Instead of going north on this Vietnam motorbike itinerary, we make a small detour south. Can Tho is a few hours ride south of Ho Chi Minh City. 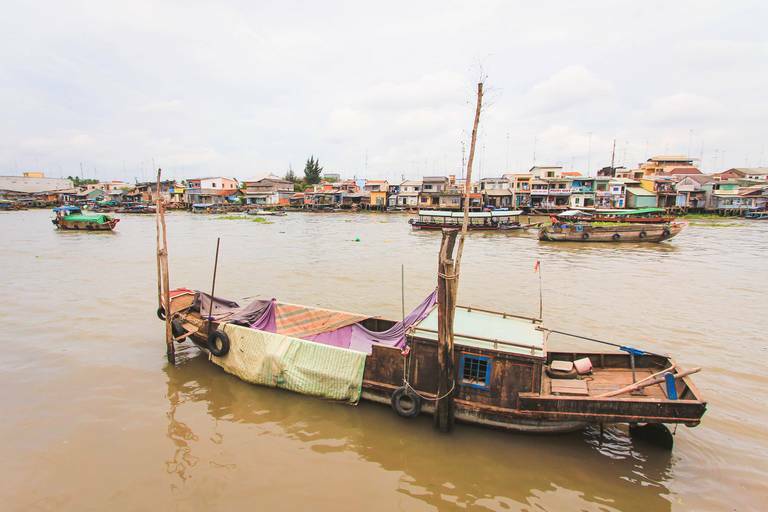 It is home to the iconic Can Tho Floating Market and the huge Mekong Delta. This is where the mighty Mekong River meets the sea, spanning an area of 39,000 square kilometers. Riding south to Can Tho uses one of the busiest highways in Vietnam called the AH1. It can be a scary first ride in the country. Be sure to leave early in the morning as riding at night gets dangerous due to the number of trucks on the road. Next, we’re taking the motorbikes to an island. Phu Quoc Island to be specific. Discover small fishing villages or do a scuba diving day trip. 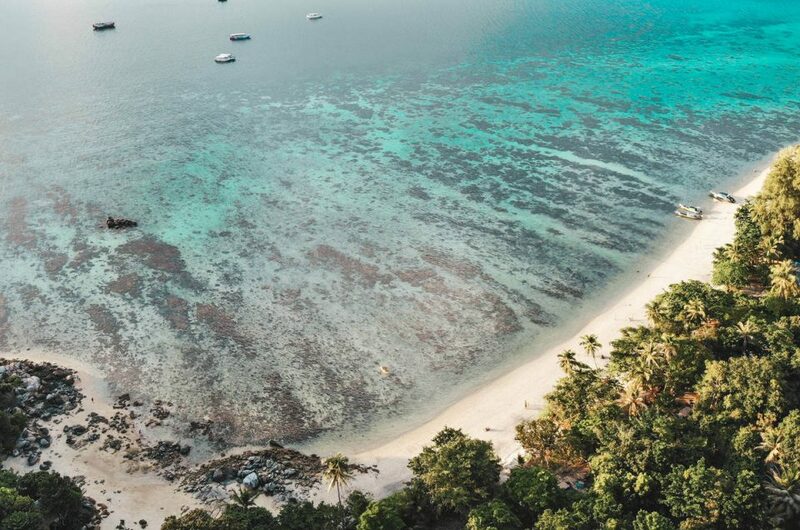 Add Phu Quoc Island to your Vietnam motorbike itinerary for a unique destination that many other travelers are sure to miss. After Phu Quoc Island we head back to Ho Chi Minh City briefly before continuing north towards Hanoi. Cat Thein National Park is my preferred first stop north of Ho Chi Minh City. The alternative route is to head to Mui Ne, however, that road has lots of trucks. On the way to Cat Thien National Park, you’ll ride back roads for hours through small villages. Once you reach the park entrance take the ferry across the river and spend a night out in the jungle. This is one of my favorite things about motorbiking Vietnam, staying in places you’d never otherwise consider. Wake up in the morning to the sound of Gibbons calling, then spend your day searching for the last White Rhino, an enigma of sorts. Relax by the riverside and enjoy Vietnam’s slow life. Cat Thien National Park is less known but an amazing destination compared to Mui Ne. 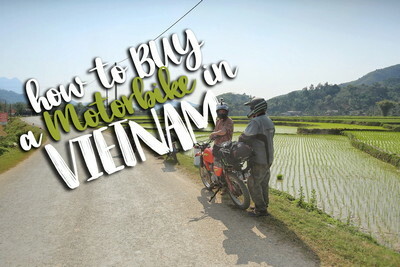 Definitely add it to your Vietnam motorbike itinerary. The Cat Thien to Dalat motorbike route passes through the small villages then head up into the mountains. There are some steep winding sections and scenic lookouts along the way. You might be familiar with Dalat from the coffee bean stores scattered throughout Hanoi and Ho Chi Minh City. Dalat is located in Vietnam’s southern highlands. It is home to many of Vietnam’s coffee fields and fruit plantations. Dalat is popular with local Vietnamese tourists for its French-style Chateau buildings and the large scenic lake in the center of town. Enjoy the slow lifestyle, the cool mountain weather, and explore the town with this Dalat City Guide. It is a nice change from the hot and humid coastal cities. 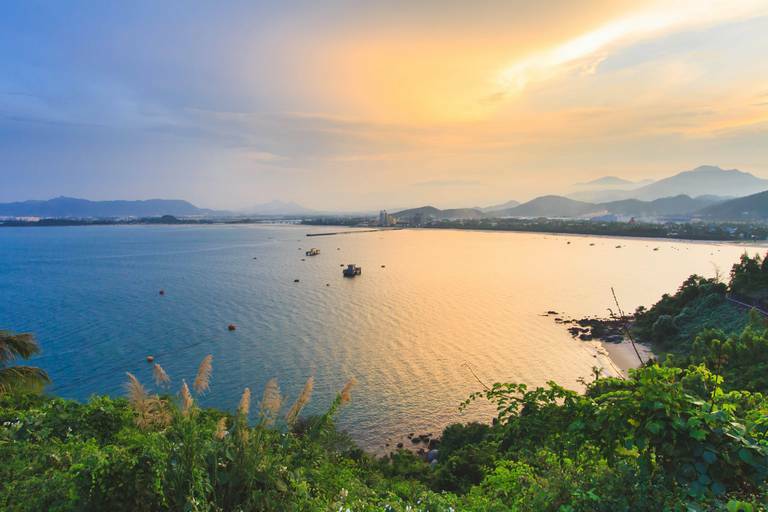 Nha Trang is one of Vietnam’s larger coastal cities, and a must stop destination if motorbiking Vietnam. The city was formerly a US Army Base during the Vietnam War. While many travelers visit the Vinapearl theme park, there are more authentic attractions such as the old war barracks and local art galleries. 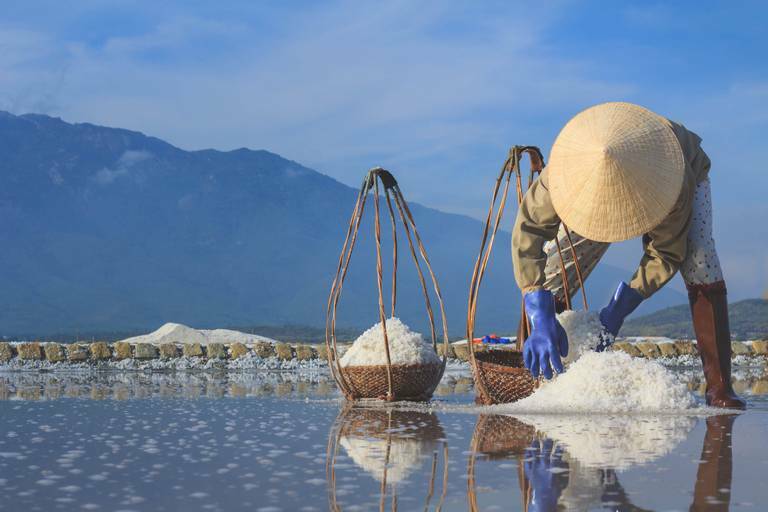 Located 50km north of Nha Trang is the Ninh Hoa Salt Fields. This was featured as the cover for Lonely Planet’s 2012 Vietnam guide. To visit the Ninh Hoa salt fields you’ll have to be on your motorbike heading out of Nha Trang by 4am. Work here finishes shortly after the sun comes up. Arrive late and it’ll be a lifeless salt flat. One of my least favorite things about motorbiking Vietnam is the trucks along the AH1 Highway. To avoid the AH1 coastal highway, we head west to Buon Ma Thuot. It is a detour, but there are far less tucks and the roads are much more scenic. Buon Ma Thuot is a small town back in the highlands, similar to Dalat but less touristy. The area is famous for producing Buon Ma Thuot coffee which you will see stocked in coffee stores all over Hanoi. I suggest visiting Buon Ma Thuot as a thoroughfare destination, saving your time for Kon Tum further north. We try to keep the daily riding distance between 150km and 200km in this Vietnam motorbike route. Pleiku fits this perfectly sitting 180km north of Buon Ma Thuot. Honestly, there isn’t a whole lot to do in Pleiku, it is a small town. There are ethnic villages in the surrounding areas which you can visit, though it is suggested a permit is required. The Bien Ho Crater Lake is an old volcanic crater which has been flooded. You can stop by here, 8km north of Pleiku, for a scenic view as you continue on towards Hoi An. Kon Tum is another coffee producing district located in the southern highlands. It’s actually one of the poorest regions in Vietnam and is home to many ethnic hill tribes in the surrounding areas. Explore the area surrounding the city to discover the local village lifestyle. You will find the traditional tall houses which are the village community centers. Along the way, you’ll likely run into crows of kids walking to and from school. They are all too keen to have a chat with you in Vietnamese and are always up for a photo. 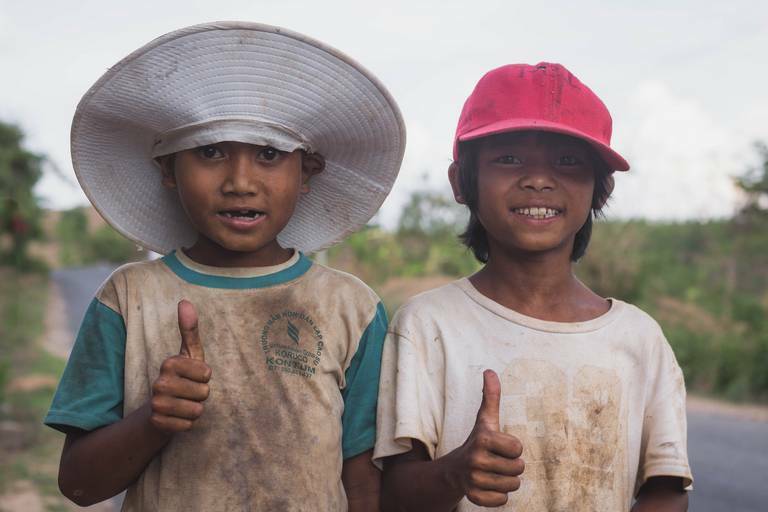 A visit to Kon Tum is an essential addition to your Vietnam motorbike itinerary. 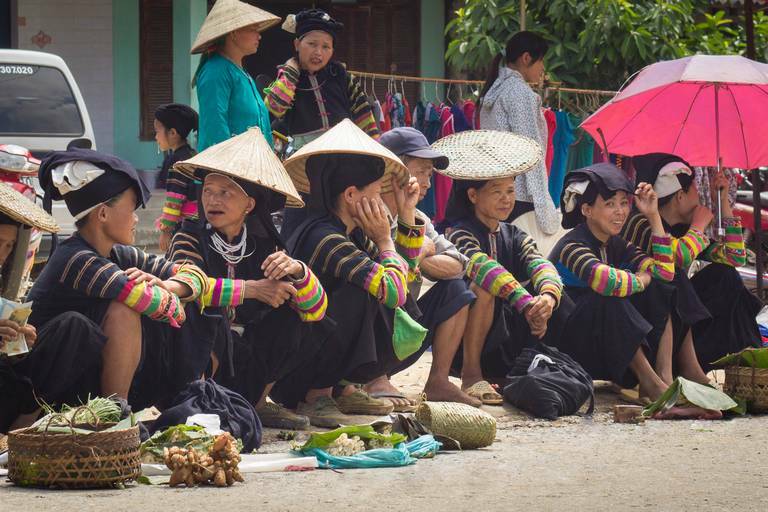 It will open your eyes to Vietnam’s true rural culture. 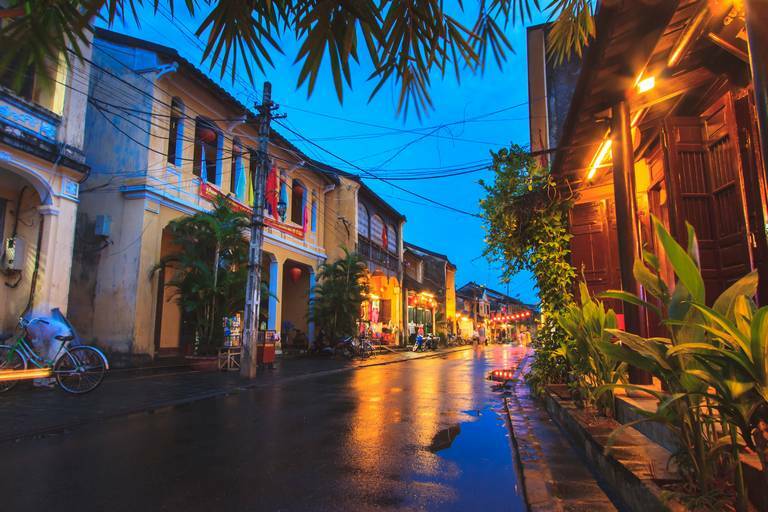 The ancient town of Hoi An is an idyllic spot in central Vietnam. Chinese style shophouses line the river banks while locals go around the small streets by bicycle. 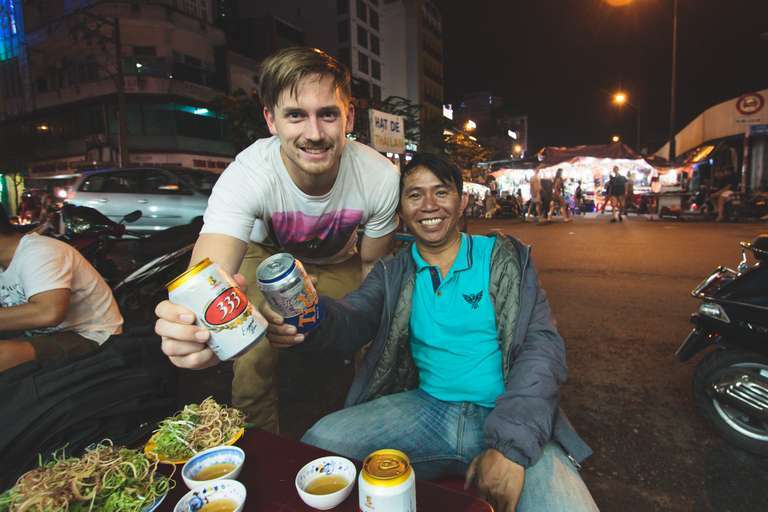 Head down to the Thu Bon River at night where you can get dinner and a beer on a junk boat. Did I mention it is also cheap? Hoi An is also famously known for its clothing production. With plenty of tailors begging for your attention as you walk the streets you’re sure to get sucked in. Pick up a custom screen printed t-shirt here as a trip souvenir for as little as USD 5 per piece. I still have mine! The Hai Van Pass (which some call the Hoi An motorbike route) is the road which Top Gear did in their 2008 “Vietnam Special.” You seriously motorbike across Vietnam without doing this route. The views from the Hai Van Pass are stunning, even more so when you ride at sunset as I did. This 21 km winding road only requires an hour or so to conquer. It will form part of your long day’s ride from Hoi An or Danang to Hue. Some people even ride it back and forth a few times in one day to make the most of it! There are no overnight stops here unless your motorbike breaks down. Hue is one of the most cultural cities I’ve experienced while motorbiking Vietnam. It is a city which combines layers of history over many centuries. 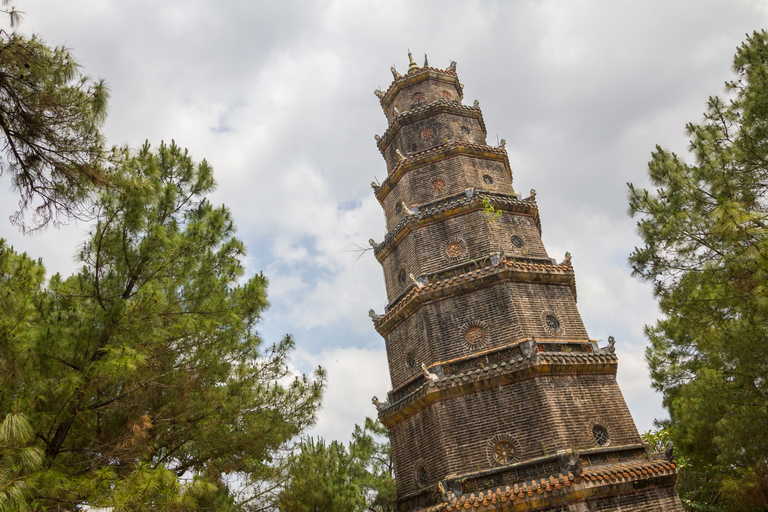 Whether you want to visit the Imperial City from Vietnam’s Dynasty Era or see the destruction left behind of the Vietnam War there are plenty of things to do in Hue. I suggest allowing three nights in Hue in your plans. Ditch the motorbike for a day and cycle or walk the sleepy streets. Another great way to get around is a boat cruise down the perfume river. Lots of people say you should skip Hue, but they’re wrong! Dong Ha is a lesser-known city located north of Hue on Vietnam’s east coast. 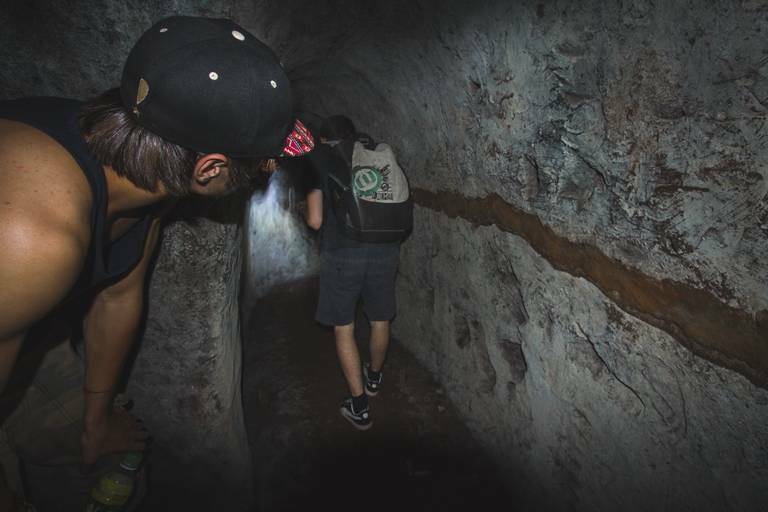 The most iconic attraction is the Vinh Moc Tunnels from the Vietnam War. The Vinh Moc Tunnels are similar to the Chu Chi Tunnels in Ho Chi Minh City, yet far more extensive and large enough to walk through. Secretly you didn’t get this tip from The Lost Passport, but ignore the ‘no entry’ sings underground and you can find a secret exit to the beach. Khe Sanh is was home to the bloodiest and longest battle of the Vietnam War. Over one thousand soldiers died fighting here. 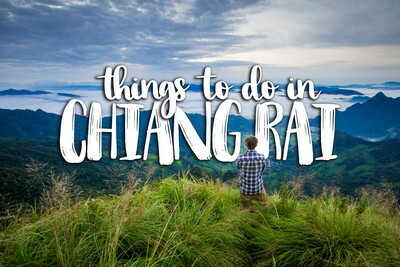 These days this little mountain town is the gateway to the amazing Ho Chi Minh Trail West. The 300km winding mountain route makes its way up to the Phong Nha Khe Bang National Park. This single landed concrete road is one of the emptiest you’ll experience in this entire Vietnam motorbike itinerary. Warning: Be careful wandering off the track up this way as there are plenty of unexploded land mines still lying about. If you are a National Geographic fan then you are sure to know about this place. 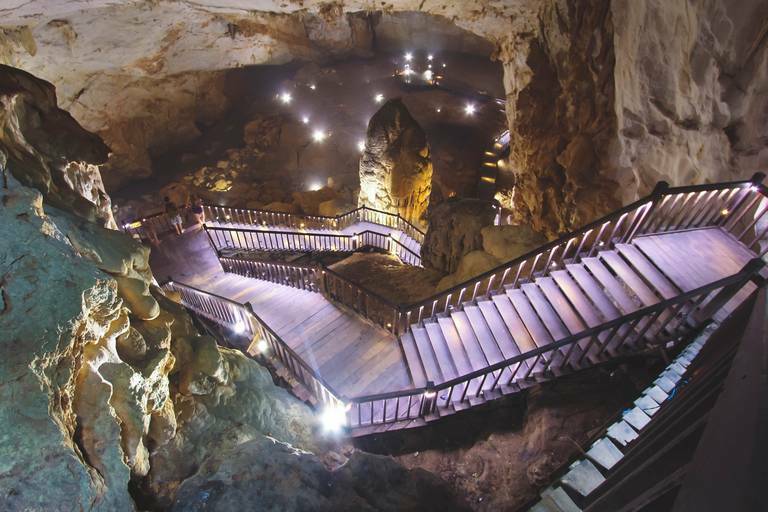 Phong Nha Khe Bang National Park is home to Hang Don Soon the world’s largest caves discovered only in 2013. This outranks the world’s second-largest, Paradise Cave, which is also in the same national park. When you are done exploring caves, make sure you visit the Phong Nha Farmstay and enjoy a cold beer on the rooftop for sunset. These are some of the best countryside views to enjoy in Vietnam. 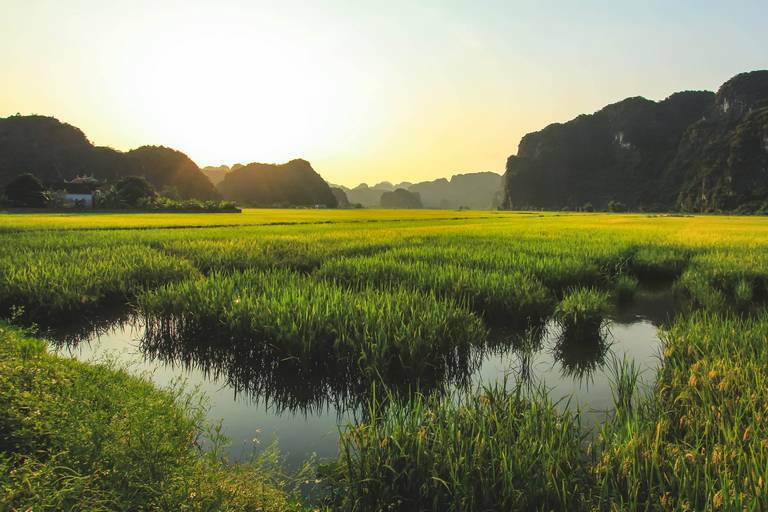 Ninh Binh is commonly referred to as the inland Halong Bay. This name refers to the thousands of karst mountains and lakes scattered throughout the countryside. It is also equally as beautiful as Halong Bay and really a must-visit on this Vietnam motorbike route. 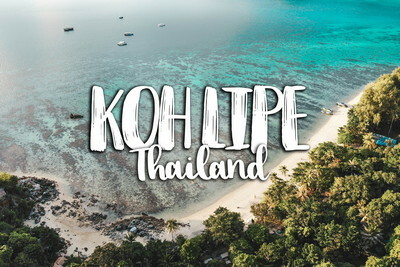 You can get really off the beaten track by exploring these small rice farming villages with your motorbike or by renting a bicycle at the town center. The villagers are extremely friendly. Expect to get stuck into a conversation in Vietnamese and be offered some homemade rice spirits! Hanoi is the capital city of Vietnam and the finishing point for many in their Vietnam motorbike itinerary. 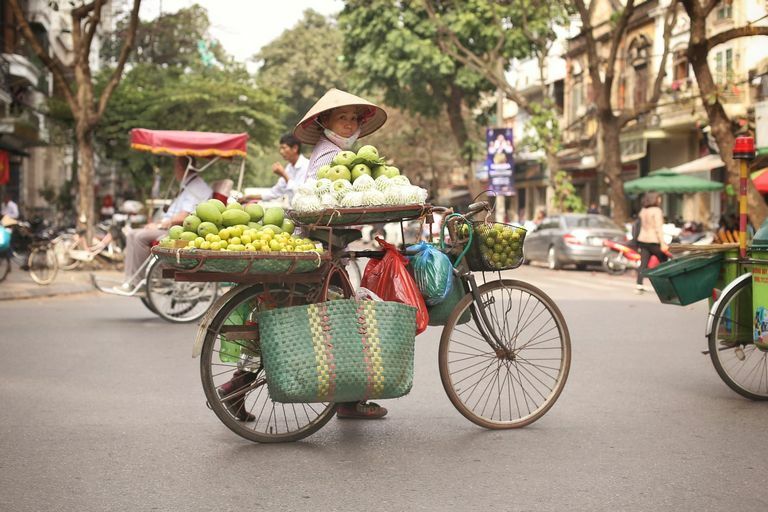 Home to 7.5 million people, Hanoi still feels like a large village rather than an industrialized city. Expect to see women pedaling around the street selling fruit and plenty of coffee stores. The food in Hanoi is amazing, and there are a few cool bars to hang out around the old town too. 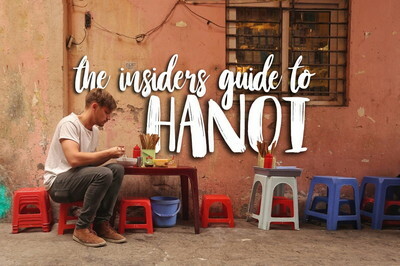 Check out my Hanoi travel guide so you don’t miss out on what this city has to offer. 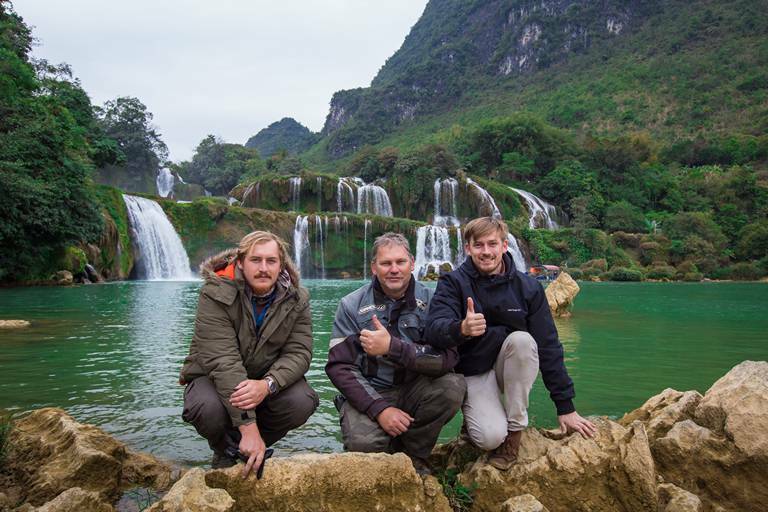 Although we have reached the main city in the north of Vietnam, this ultimate Vietnam motorbike itinerary does not end here. From Hanoi, you still have the option of traveling east to Halong Bay or north to the highlands on the China border. Have you considered taking your motorbike into Halong Bay? Sounds crazy but it is possible. Cat Ba Island is technically located in Lan Ha Bay, slightly north of Halong Bay. Although less known it is arguably more amazing to visit. Cat Ba is one of the largest islands in Lan Ha Bay and offers plenty of accommodation, secluded beaches, rock climbing, and day trips out on the water. You can get to Cat Ba Island with your motorbike by taking a ferry from Haiphong. The ferry goes fairly slow and the trip across takes a couple of hours. 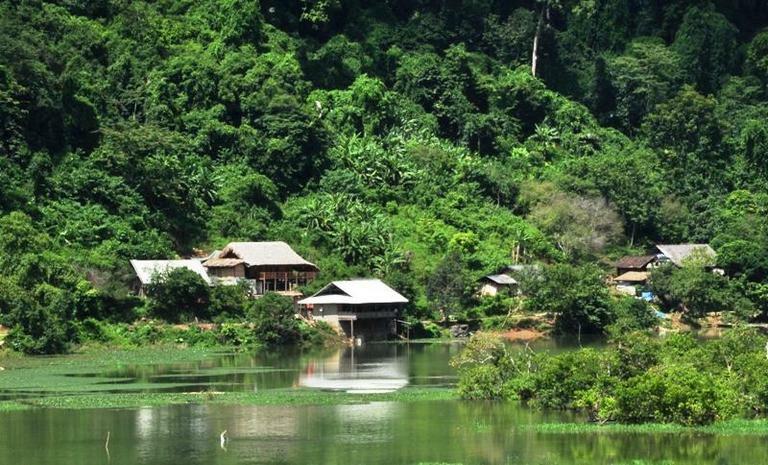 Bac Kan is a rural town in northern Vietnam and home to the picturesque Ba Bae Lake. 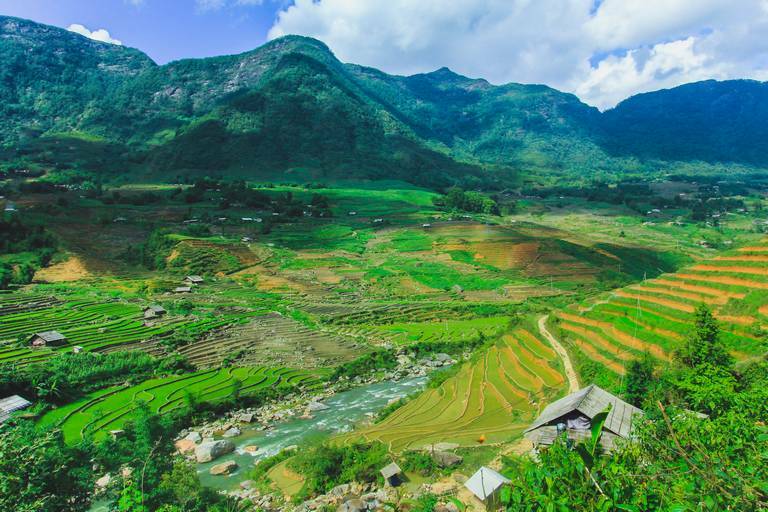 This destination is located mid-way up from Hanoi to Cao Bang Province and is an ideal overnight stop. There are a number of budget hotels and homestay accommodation options around the lake in a relaxing countryside setting. Located on the northern Vietnam-China border, the impressive Ban Gioc Waterfall is the largest waterfall in Vietnam. Although plastered all over the walls of travel agents in Hanoi, this waterfall is rarely visited by western tourists. You can take your motorbike right down near the water’s edge then explore the area for a while. Be sure to drop into the nearby Ngam Ngou Cave if you have time also. 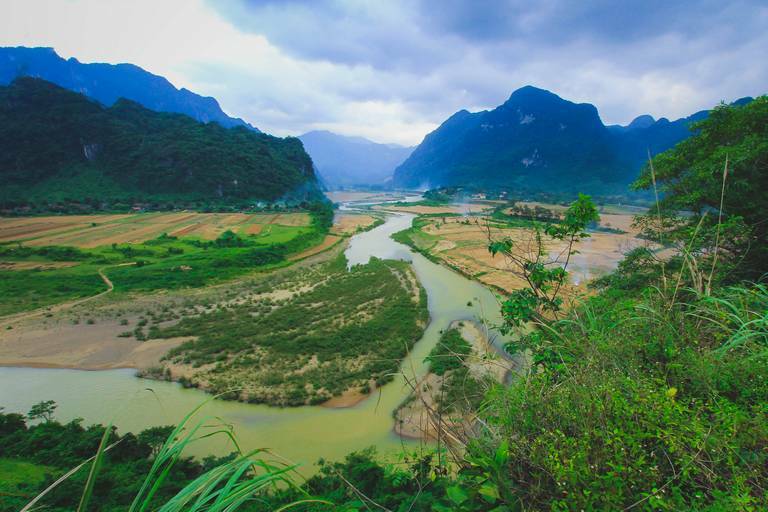 Cao Bang is both the province and city in northeast Vietnam. 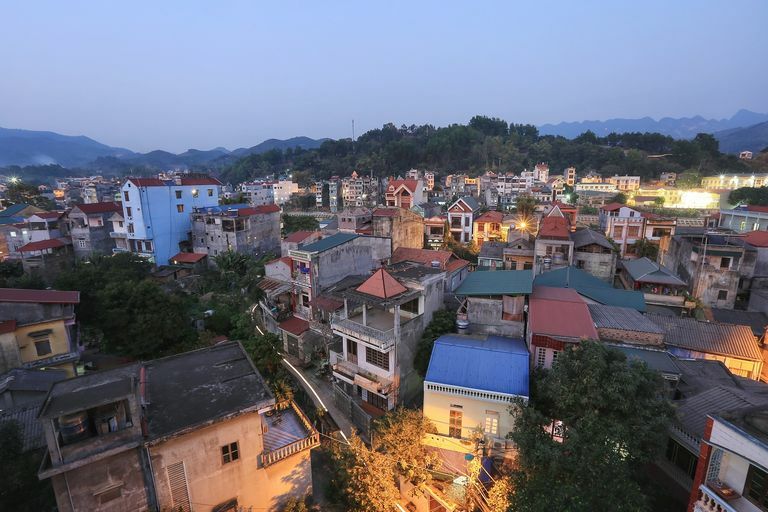 The city of Cao Bang feels like an oversized village but not on the same scale as Hanoi. You can explore the riverside and stop by small cafes and the morning markets. You can quickly get a local feel of this authentic northern Vietnam town. 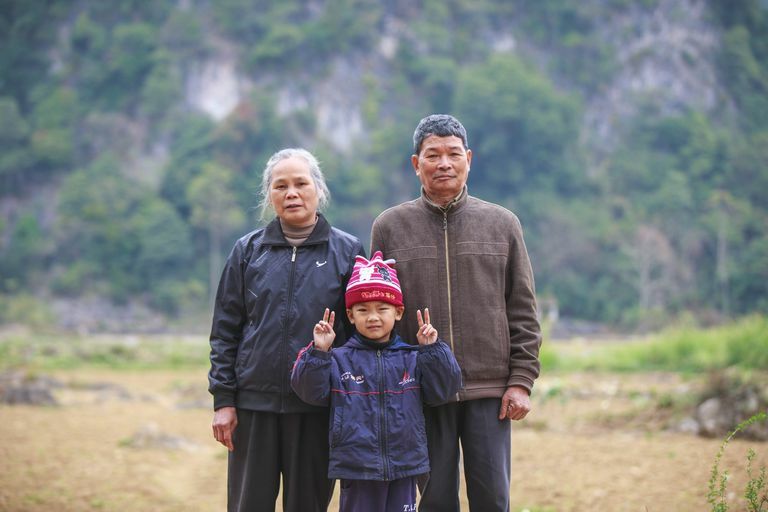 For a true countryside experience try staying at the Kieu Chinh family homestay. This homestay is located about 50km outside of Cao Bang in the rural district of Quang Uyen. Full directions available in my article. The small village of Bao Lac is located at the foothills of Vietnam’s northern mountain ranges. The tranquil town is home to a twice-monthly market in which hundreds of ethnic villagers descend from the mountains to sell their local produce. On these weekends the town is a lively place, but it can be difficult to time your trip accordingly. Every other day of the month the town is rather quiet, but a peaceful rest stop before heading up the mountains. Check out some of the small restaurants along the river. Get ready for the most scenic part of this entire Vietnam motorbike route. The road from Bao Lac to Dong Van is one of the best motorbiking roads in the world. It is called the Ma Pi Leng Pass. You will ride up the steep mountain pass to an altitude of over 2,000m. The air temperature drops to a cool 5 degrees C in the winter, so be prepared with a decent jacket. As you ride along this route you will be completely awestruck with panoramic views that seem to go on and on. The views over the mountain range are incredible. In the distance, you will actually be looking at the mountains of southern China in Yunnan Province. 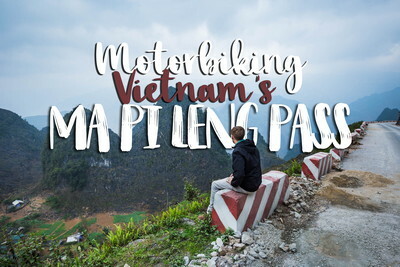 Be sure to read my full guide to the Ma Pi Leng Pass for all the essential details. This is a road that you will ride once and never forget. I wouldn’t be surprised if you end out riding it back and forth a few times! Ha Giang is a medium-sized city at the western foothills of the mountain range. This city is a popular launching or rest point for adventure motorcycle riders heading up the mountains. 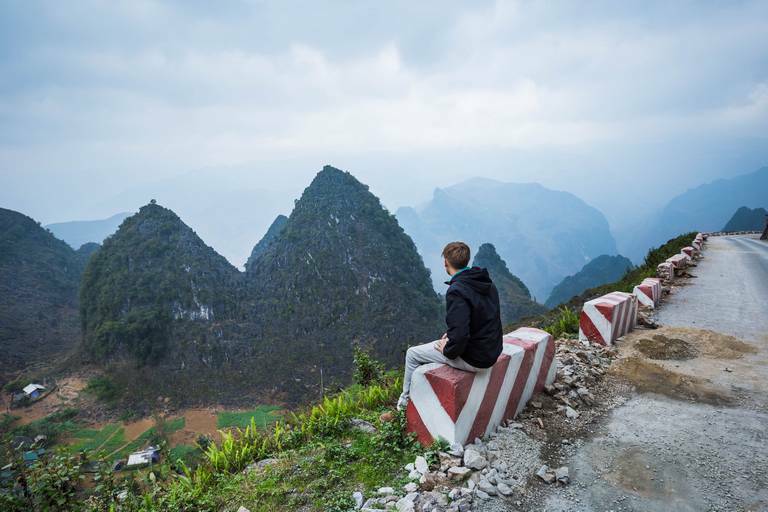 The altitude at Ha Giang is where the temperature starts to drop down to a cool 5 to 10 degrees in winter. Be sure to pack your jacket, scarf, and gloves if you plan to continue motorbiking up the mountains from here. 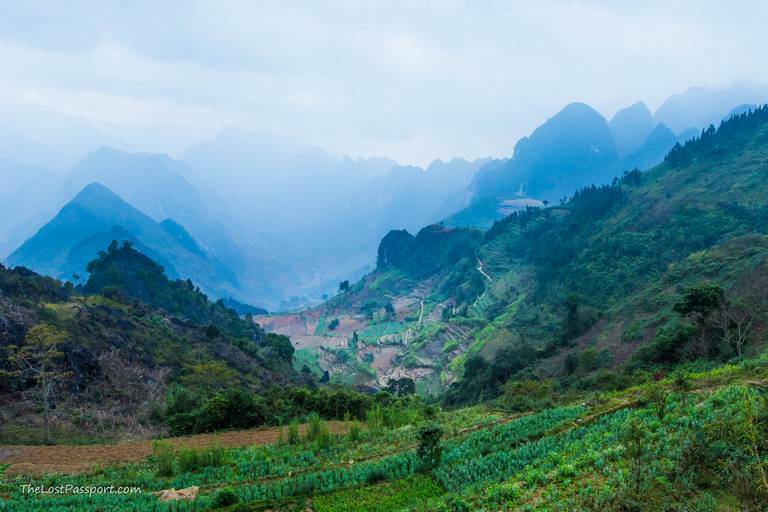 The northern district of Sapa has been growing in popularity over the past few years. Sapa is famous for hill treks, and homestay accommodations. It is a great place to visit while motorbiking Vietnam’s northern end, however, I still think it the more touristy version of Ha Giang. If you do visit Sapa I suggest staying at least two days. The first day you can go hiking through the terraced rice fields, the next day you can climb Mount Fansipan. Both great one day activities. 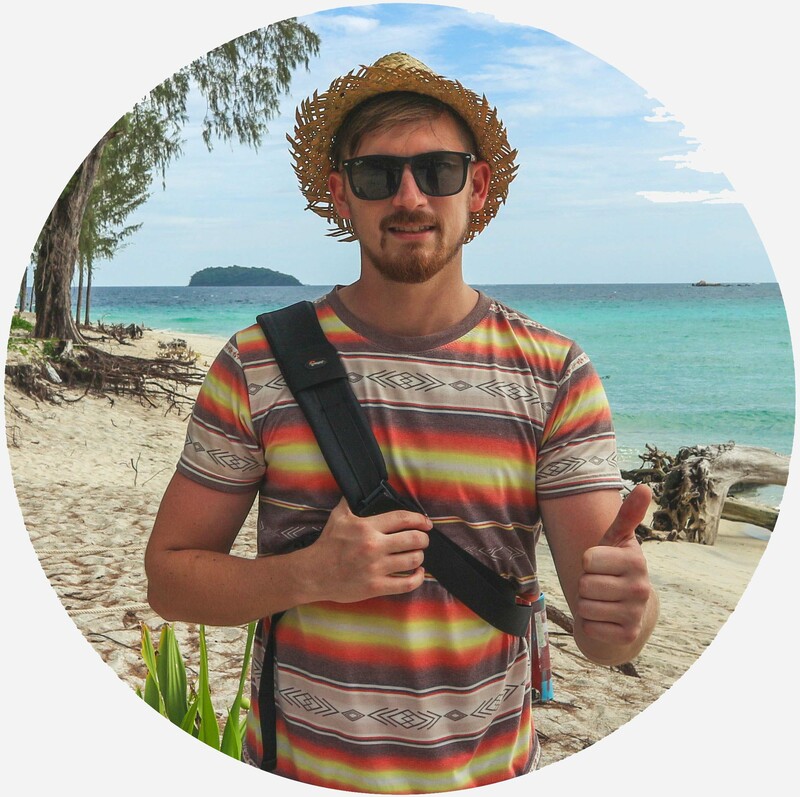 Can you do this with only 3 weeks in Vietnam? 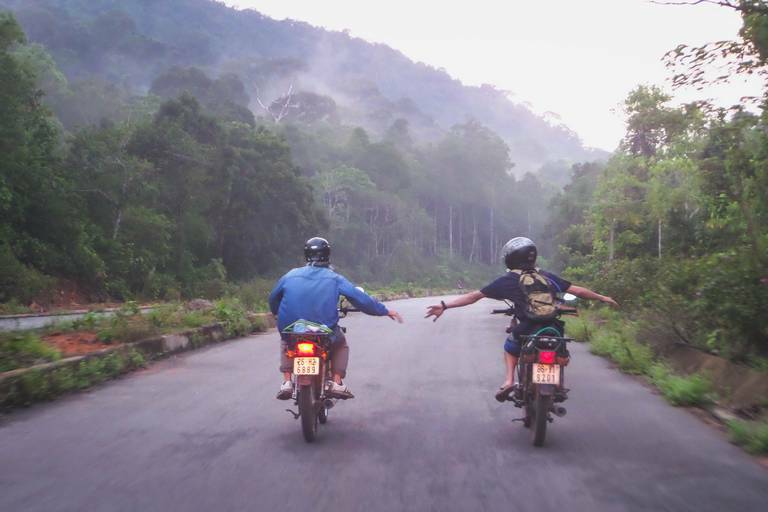 You will not be able to complete this entire motorbike route with only 3 weeks in Vietnam. Vietnamese motorbikes are slow, the road condition is bad, and there are too many stops. Ultimately, you will be too rushed. If you have less than 3 weeks in Vietnam, I’d also suggest hiring a motorbike. With a shorter trip, you will probably waste valuable time buying and selling a motorbike. Renting is just easier, and possibly cheaper. Share this guide and you are more likely to find people to join you on the trip! Vietnam is the awesome country , your blog is awesome , thank you for sharing the nice pictures. Motor Bike travelling is Great , personally my favorites , i read your its so interesting , thank you for sharing Blog. Vietnam is my country and motor bike travelling is very popular in my contry .Thank you for posting this awesome article. I’m a long time reader but I’ve never been compelled to leave a comment. I subscribed to your blog on facebook and shared this on my Twitter. Motor bike trip is always great. You wrote an amazing blog. A big appreciation for you. Loved the way you narrated your experience. Just loved the whole write up.